Growing up we always celebrated St. Pats with some good ol' corned beef and cabbage, now that corned beef is out of the picture, the Husband and I have to get creative. Last year I made a Cabbage Casserole - he liked it, I kinda thought it was a combination or bland and too much heavy cream. 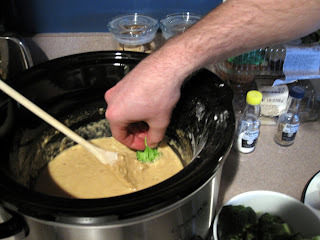 This year I was inspired by our new crock pot to make a Beer & Cheese Fondue. 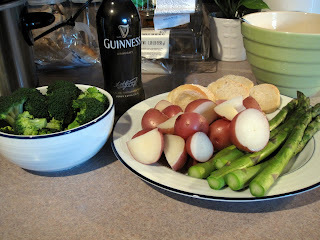 Served with Irish Soda Bread and, naturally, Red Potatoes amongst some other fresh steamed veggies. I'll be making this on St. Patrick's Day so no pictures or reviews (yet), but maybe you'll be inspired to stuff your face with this Irish couple's two favorite food groups - cheese and beer. Steam all vegetables until tender, about 15 minutes. Arrange vegetables and apples around edge of large platter. Meanwhile, toss cheese with flour in large bowl. Bring 3/4 cup stout, juice concentrate, and mustard to simmer in large saucepan over medium heat. Gradually add cheese mixture, stirring constantly, until cheese is melted and smooth, thinning with more stout, if desired. Season to taste with salt and pepper. Transfer fondue to bowl. Place in center of platter with vegetables. UPDATE: The Irish Cheddar definitely has some bite, but that's to be expected with any aged cheddar... Overall the recipe was a hit, if you aren't big on "tasty" cheeses and prefer a milder flavor, substituting some classic Cracker Barrel or even some Velveeta would be a nice, smoother (albeit less Irish) concoction. I saw that on Epicurious and was thinking of giving it a shot (along with some Soda Bread). Do you have any idea what "Irish Cheese" is? 'Cause I have no clue. 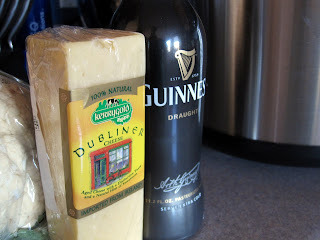 My grocery store sends me email updates with dinner ideas- last week it sent one about pairing Irish Cheese and Stout (how I got my idea for the fondue)... according to the website they recommend Kerrygold Vintage Dubliner Irish Cheese. If your store has a 'gourmet cheese' section they probably should have some Irish cheeses - GOOD LUCK!!! Second, let me say thank you again for the wonderful recipe; as a fellow pescatarian I was wondering how on Earth I'd get by w/o corned beef and cabbage. This shall do. 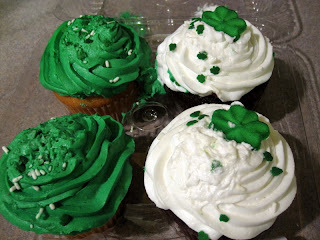 If it were me, I would have taken the cupcakes out of the container and passed them off as my own!! Then basked in all the compliments of how well I decorate little desserts! Bahaha.. I so should have done that!